On rare calm days, the most striking thing you notice at an altitude of more than 8,000 feet on an Antarctic glacier is the silence. "There was just no sound; no air handling equipment, no leaves rustling, no bugs, no planes or cars. So quiet you just heard your heartbeat," said Barbara Cohen, planetary scientist at NASA's Goddard Space Flight Center in Greenbelt, Maryland. Most of the time, however, there is a steady howl of bitter cold wind flowing down from the East Antarctic ice plateau. With a summer temperature hovering around zero Fahrenheit, "It's the wind that makes you cold," Cohen said. 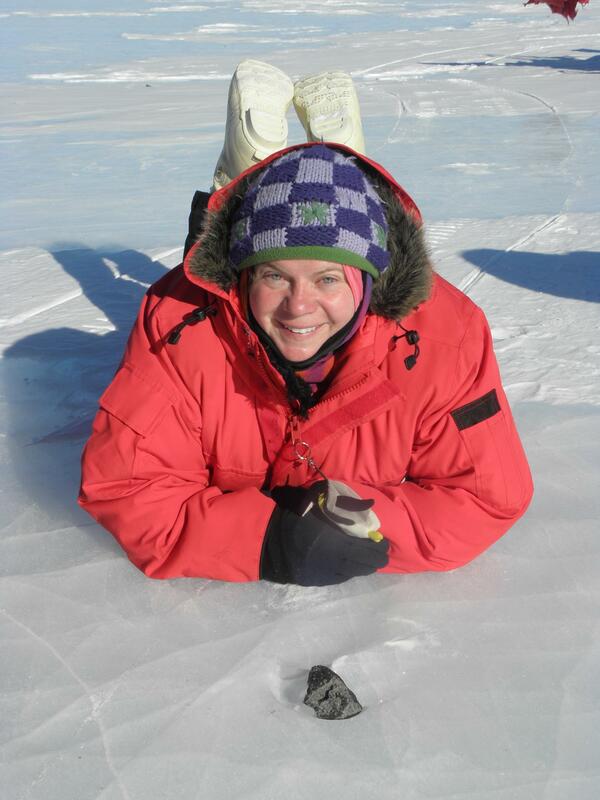 Cohen made her fourth expedition to Antarctica beginning November 26, 2017 to collect meteorites for the Antarctic Search for Meteorites (ANSMET) program, a Case Western Reserve University project supported by NASA, with logistical support provided through the U.S. Antarctic Program at the National Science Foundation, and curatorial support from the Smithsonian Institution and NASA's Johnson Space Center. The space rocks come from all over the solar system, most of which are fragments from asteroid collisions but some were ejected from the surfaces of the Moon and Mars by asteroid or comet impacts. Some of the fragments fall to Earth as meteorites and become embedded in the Antarctic ice. Although meteorites frequently fall all over the world, they get concentrated in special places in Antarctica, making them easier to find. As meteorites strike glaciers, they get buried in the ice and accumulate over thousands of years. As the glaciers slowly flow, the meteorites are carried with them. If a glacier runs up against a large obstacle, like the Transantarctic Mountains, the ice rises and meteorites are brought to the surface. Dry Antarctic winds gradually erode the ice, exposing the meteorites. As more ice rises to the surface, the process repeats. Given enough time, a significant accumulation of meteorites builds up. The eight-person team on the latest ANSMET expedition searched one such special area near Mount Cecily and Mount Raymond in the Transantarctic range, collecting over 250 meteorites. Like most ANSMET team members, Cohen volunteered to be a participant to collect the meteorites. "My research relies on having meteorites from the Moon, Mars and asteroids, and when meteorites are in private hands or museum collections, I may or may not be able to get a piece for my research," said Cohen. "But the ANSMET meteorites are a free and open collection – anyone can write a research proposal and get allocated a meteorite. For me, it's a crucial community service to go down there and help find these things, to build the collection." To date, ANSMET expeditions have recovered over 22,000 meteorites, for a fraction of the cost of a single space mission to return a sample. Of course, it's a challenge to get to a glacier in Antarctica. If accepted as a volunteer, the ANSMET program pays for the participant's travel, which includes commercial flights to Christchurch, New Zealand, the U.S. National Science Foundation (NSF) base of operations for those deploying to Antarctica. In Christchurch, volunteers are issued cold weather gear from the clothing distribution center, and then board a LC130 military cargo plane. It is outfitted with skis over its landing gear for the flight to the McMurdo Antarctic station, and lands on an ice runway. McMurdo is the main U.S. base in Antarctica, and there the team draws the rest of the supplies for the expedition, including tents, stoves, food, snowmobiles, and meteorite collection kits. This season, the team and their gear were loaded into another LC130 for a flight to Shackleton Glacier camp, an intermediate base amid the Transantarctic Mountains. The group then split into two teams of four, and took a series of flights on a smaller plane, called a Twin Otter, to reach their field sites on the Antarctic plateau. They remained on the Antarctic plateau for about six weeks recovering meteorites. The location is so alien, isolated and extreme that NASA sometimes sends astronaut candidates there as volunteers to train for space missions. "There's nothing, no biology," says Cohen. "Even though we're not able to bathe and can only use wipes, it's kind of okay because everything is frozen and there's nothing to make you stinky or cause your food to rot." Besides the obvious danger of the cold, fire is a major concern. "We heat the tents with a regular camping stove that hooks up to a propane tank, so there are open flames in the middle of our tent," says Cohen. "We make sure someone's eye is always on that flame, and we make sure we've got good ventilation so we don't get carbon monoxide poisoning." Each team had a mountain guide to navigate hazards like crevasses in the ice and to administer first aid, if needed. If a serious accident were to happen, the team might have to wait for clear weather to evacuate, so safety is always paramount. Because ordinary terrestrial rocks can get plucked off the mountains and mixed with meteorites in the ice, it helps to have an experienced eye when searching for them. "As one of our previous participants said: meteorites are black except when they're not, they're round except when they're not, they have a fusion crust except when they don't, they have metal except when they don't. Meteorites are a diverse collection of solar system material – we're not looking for one thing; we're looking for what doesn't belong in Antarctica," said Cohen. When team members found meteorite candidates, they took photographs of them and recorded their GPS locations. Then they carefully placed the potential meteorites in sterile bags to avoid contamination. At the end of the expedition, the meteorites were shipped, still frozen, to the Antarctic Meteorite Laboratory at NASA's Johnson Space Center in Houston, Texas. When the meteorites arrive in April, they will be thawed, dried and thoroughly examined to determine what type they are and where they might have originated. The results will be published in the September issue of the Antarctic Meteorite Newsletter that is distributed to researchers and facilities around the globe twice each year. The newsletter invites interested researchers to request samples for their investigations by submitting requests to the Meteorite Working Group, which is composed of meteorite researchers who review the requests and recommend allocations. ANSMET has been continuously funded since 1976. Current ANSMET support comes from NASA's Near Earth Object Observations program. Curation and characterization work is supported by a partnership between NASA, the Smithsonian Institution, and NSF in Washington, DC. ANSMET's Co-Principal Investigators are Ralph P. Harvey of Case Western Reserve University, Cleveland, Ohio and Jim Karner of the University of Utah in Salt Lake City, UT.